OSHA initiated an inspection of the Birdsboro Kosher Farms Corp. chicken processing company in Pennsylvania after receiving notice that a worker suffered a thumb amputation while operating a mixing machine. At the same time, OSHA followed up on inspections done in 2013, 2014 and 2015. Violations included failing to: protect workers from the unexpected start-up of machinery; cover floor holes; secure compressed gas cylinders; and provide personal protective equipment at no cost to workers. OSHA issued 10 willful and serious violations totaling $317,477 in proposed penalties. Read the news release for more information. After learning that a machine operator suffered third-degree burns from falling into a 170-degree acid-etching tank, OSHA inspected A-Brite Plating in Cleveland. The employer failed to report the incident to OSHA as required by law. Inspectors found other workers climbing on top of the same tanks. The agency posted an imminent danger notice at the auto parts plating company and issued nine safety and health violations. "During our investigation OSHA found the company was well aware of the dangers of falling into the tank because at least seven employees had fallen while clearing machine jams in the past five years," said Howard Eberts, area director in OSHA's Cleveland office. For more information, read the news release. Alliance Ground International, a Chicago-based airline cargo-handling company, was cited for nine safety violations after exposing workers to struck-by and electrical hazards at O'Hare International Airport. The company was cited for the same violations at its Chicago facility in 2014 and its Schiller Park facility in 2013. In response to a complaint and as part of the agency's Regional Emphasis Program on Powered Industrial Vehicles, violations found included failing to: remove damaged forklifts from service; inspect and maintain fire extinguishers; and maintain electrical equipment to prevent exposure to electrical panels and wiring. Proposed penalties total $338,881. Read the news release for more information. A follow-up inspection of Wayne Lumber and Mulch Inc. found that the company continued to expose workers to electrical and combustible dust hazards, and inadequate machine guarding. In addition to 40 prior citations for similar violations, the company was recently cited for 27 more when it exposed workers to crushing and rollover hazards while operating machinery without installed seatbelts, and falls up to 10 feet. Other violations included allowing workers to use damaged welding cables; failing to test repaired acetylene and oxygen burning torches before use; and failing to have lockout/tagout procedures in place to prevent accidental machine start-up. Proposed fines total $214,633. For more information, read the news brief. The Hawaii Occupational Safety and Health Administration issued $115,500 in penalties to the University of Hawaii School of Earth & Science Technology in Honolulu for safety violations following a March 16 laboratory explosion. Researchers were working with a mixture of hydrogen, carbon dioxide and oxygen when a spark ignited a containment tank, resulting in an explosion that injured three workers. HIOSHA inspectors determined that the university failed to reduce employee exposure to explosion and fire hazards or provide proper training, adequate personal protective equipment or a sufficient number of exits. California OSHA fined La Pafe Inc. (Le Chef Bakery) in Montebello $196,450 after a worker suffered fractures and lacerations to his hand and fingers. The worker was scraping material from a machine while it was operating, which caused his right hand to become entangled in the turning conveyor. Cal/OSHA inspectors concluded that the company failed to ensure that the machine could not be activated during cleaning and servicing, resulting in a permanent disfiguring injury. A new OSHA final rule establishes procedures and time frames for handling retaliation complaints under the Seaman's Protection Act. The act protects seamen from retaliation for protected activity, such as informing the government about violations of maritime safety laws or regulations. "This final rule makes good on the promise to stand by those workers who have the courage to come forward when they believe their employers are violating maritime safety laws," said OSHA Assistant Secretary Dr. David Michaels. For more information, see the news release. OSHA has scheduled a meeting of the National Advisory Committee on Occupational Safety and Health's OSH Professionals Pipeline Work Group to be held Oct. 18 in Washington, D.C. The meeting will allow the work group to hear from representatives of professional safety and health organizations and other stakeholders about their initiatives, best practices and model programs to promote careers in occupational safety and health. For more information, see the news release. 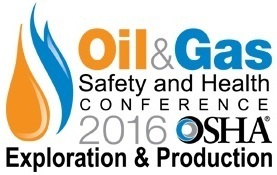 Representatives from OSHA and UT Arlington OSHA Training Institute Education Center will meet Nov. 29-30 with other regulatory agency representatives and oil and gas industry leaders in Houston for the 2016 OSHA Oil & Gas Safety and Health Conference. Speakers will update participants on the latest OSHA focus areas, industry best practices and trends, and new areas of research. OSHA Assistant Secretary Dr. David Michaels, National Institute for Occupational Safety and Health Director Dr. John Howard, and National Safety Council President & CEO Deborah Hersman will be among the speakers. The conference will feature more than 75 exhibitors. For more information visit the conference website. OSHA has renewed an alliance with Permian Basin South Texas Exploration and Production Safety Network to provide information and training resources to help protect the safety and health of workers in the oil and gas industry. During the three-year agreement, the organizations will work to prevent workers' exposure to fire, explosion, struck-by, caught-between, fall and chemical hazards, and to encourage a better understanding of workers' rights and employer responsibilities. Read the news brief for more information. OSHA and Turner Construction Company have established a partnership to protect workers building a data center in Northlake, Ill. The partnership includes trade unions and 15 subcontractors with a combined workforce of more than 500 employees. The partnership will focus on preventing injuries and illnesses on the job, particularly from the top four hazards in construction: falls, struck-by, caught-in/between and electrocutions. Employers, contractors and subcontractors have agreed to implement written safety and health programs by conducting daily planning, safety huddles and jobsite inspections, and by involving workers in weekly safety meetings. 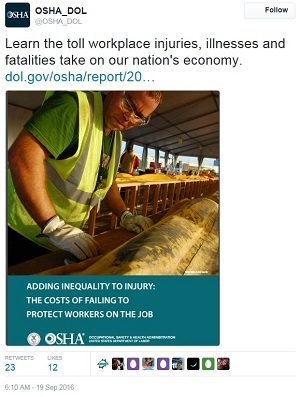 OSHA will review these programs, track information, share best practices, and review goals for keeping workers safe and healthy. For more information, read the news release. Electronic Systems Inc., a manufacturer in Sioux Falls, N.D., was accepted into OSHA's Safety and Health Achievement Recognition Program after using the agency's On-site Consultation Program to establish an exemplary safety and health program. ESI invited OSHA consultants to audit the company's health and safety program, and examine air quality and noise hazards. As a result, ESI made improvements to its personal protective equipment program and "near miss" incident reporting procedures. OSHA's consultation services are separate from enforcement and do not result in penalties or citations. The program offers free, confidential safety and health advice to small and medium-sized businesses with priority given to high-hazard worksites. OSHA has released two fact sheets that stress the importance of tracking metrics and investigating potential hazards to prevent workplace injuries, illnesses and fatalities. The Use of Metrics in Process Safety Management Facilities provides employers with a list metrics, or measurements, tracked by facilities in OSHA's Voluntary Protection Programs that handle highly hazardous chemicals. OSHA and the Environmental Protection Agency collaborated on The Importance of Root Cause Analysis During Incident Investigation, which urges employers to investigate incidents that nearly led to a worker injury and find ways to prevent similar incidents. 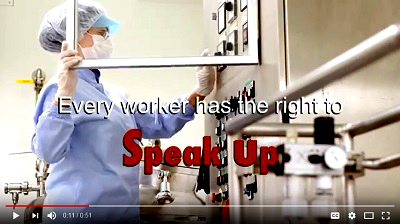 OSHA has released a one-minute video, available in English and Spanish, to inform workers exposed to jobsite hazards of their right to file a complaint with OSHA. The video emphasizes that filing a complaint is easy and confidential and that it is illegal for employers to retaliate against workers for doing so. QuickTakes is emailed free twice monthly to more than 150,000 subscribers. You can receive it faster and easier by subscribing to the RSS feed that delivers almost instant information. Visit OSHA's RSS Feeds Web page to subscribe.